A 150m long tunnel that begins in India and seems to extend beyond the Bangladesh border was detected at Fatehpur in Chopra block of North Dinajpur with suspicion being pointed to infiltrators and smugglers. North Dinajpur district police said some local people had spotted the tunnel's opening, measuring 4X2 feet, near a tea plantation on the Indian side and informed the personnel of the 149 battalion of the BSF posted in the area. 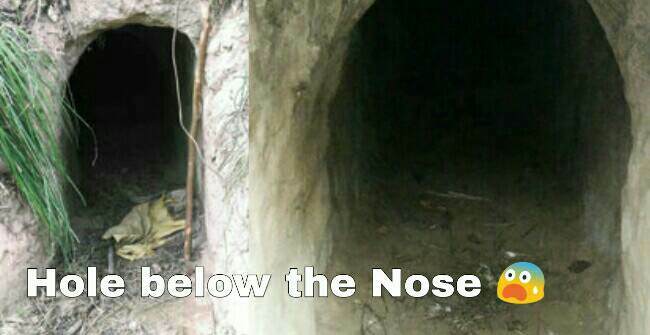 "BSF officers have visited the spot and they suspect that the tunnel was dug for infiltration and smuggling. They have started an investigation," a senior police officer said. Two small holes, measuring around 18X12 inches, have been found near the opening of the tunnel that is 100m long on the Indian side. "Preliminary probe has revealed that the tunnel was probably dug from the other side of the border. The other end of the tunnel, it seems, is around 50m beyond the border fence. It is obvious that the tunnel passes under the fence," a source said. The tunnel is around 1.2km from Arugach, the nearest Indian village. Puratan Atwari, the closest Bangladesh village, is around 1.5km from the site. Officials of intelligence agencies said that the tunnel was located in Chopra block made them suspect that it was dug for infiltration. "In Chopra block, the width of India comes down to just a few kilometres and falls in the chicken's neck area of the country. Nepal and Bangladesh are on either side of the area. We suspect that the tunnel was built for infiltration of criminal elements who want to cross over to other countries like Nepal," an intelligence official said. He also pointed out that the Bengal-Bihar border was close to the block and infiltrators could easily sneak into the neighbouring state. "The tunnel with an opening of 4X2 feet size is unlikely to be used for smuggling of contraband alone. It is quite large and if this is the average dimension throughout the tunnel, it is obvious that it was dug for infiltrators and some local people are involved in it," the official added. Amit Kumar Bharat Rathod, the superintendent of police of North Dinajpur, said: "We have received detailed information from the BSF that also filed a complaint with us. Police have been sent to the spot. A probe has been ordered to find out who dug the tunnel and what their purpose was."